This is crazy stuff! I hope this never happens to me!!!!! PHOENIX, Arizona (Reuters) - A hefty bystander at a road accident in southern Arizona heaved a car clean off a trapped teenage cyclist, possibly saving his life, police said on Friday. Eighteen-year-old Kyle Holtrust was struck by a car as he pedaled along a Tucson highway late on Wednesday and pinned beneath it, city police said. Tucson paintshop worker Tom Boyle grabbed the Chevrolet Camaro car and lifted it, allowing the driver to haul the injured cyclist clear. "He lifted that side of the car completely off the ground," police spokesman Frank Amado told Reuters by telephone. Amado said Holtrust was being treated in hospital, and was expected to make a full recovery. Local media said Boyle is 6 feet four inches tall and weighs 300 pounds (136 kg). "It was outstanding," Amado said. "It is quite unusual to have that strength." I’m a night-owl and like to sleep in late. This past Thursday, 7:00 a.m., I was awakened by a phone call from my publisher. As a rule I don’t answer my publisher’s calls and let them go to voice mail. “Neil, wake up! They found Floyd positive. Find out what’s going on and call me back!” After several days of researching, this is what I’ve found out. First off, let’s all take a collective breath and settle down. First, he is not positive for anything. At this point all that has been identified is an abnormality. An abnormality in his ratio of testosterone to epitestosterone. As I write this we are still waiting for the “B” sample to confirm whether that finding is accurate. As Floyd has said, more than likely the “B” sample will come back affirming that his ratio of testosterone to epitestosterone in his body is greater than the 4:1 ratio that the UCI has set as a threshold. But let’s look at the facts: if he was taking testosterone he would have need to have been on a course of this drug for weeks, not the day after his disastrous stage 16 [Dr. G. Forbes, Journal of American Medical Assoc. 1992 page 397-399]. A person can’t take testosterone exogenously one day and the next have a miraculous turn around the next. What the media has been stating is that Floyd has elevated testosterone, and that is simply not true. His ratio of testosterone to epitestosterone is greater than 4:1, which does not mean his testosterone is high. Also, testosterone is not a drug that a cyclist would take. Testosterone builds muscle mass, the last thing a Tour de France winner wants. 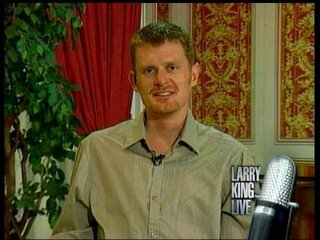 Floyd’s doctor, Brent Kay, explained it on Larry King Live. KING: How do you explain the high level of testosterone? KAY: He has a high ratio of testosterone to epitestosterone in his urine. KAY: Which could be due to an elevated testosterone level. It could be due to a lower epitestosterone level. And it could be due to a variety of other factors with handling and specimen contamination and various other things. People have asked me, “But look at his comeback from his bad day to winning by eight-minutes the next.” If you know anything about the sport of cycling and the tactics employed this is easily explained. Stage 16 was a course full of undulations. 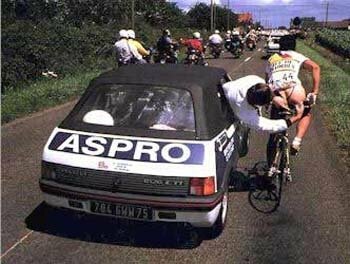 With the pressure of the Yellow Jersey, he did what athletes sometimes do, forget to eat and drink enough, and he ran out of energy. The next day in Stage 17, with nothing to lose, he attacked on the first climb of the day. While a strong attack, it was nothing that his opponents couldn’t go with. Floyd gambled; he had nothing to lose and realized that the only way to make up the eight minutes loss from the previous day was to go early. The chase behind was unorganized. 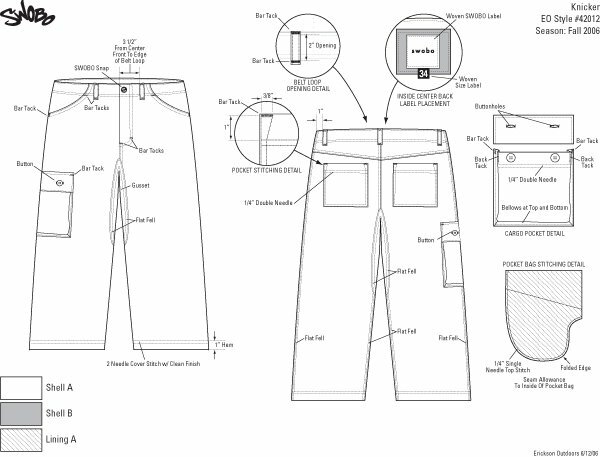 CSC and T-Mobile looked at the Yellow Jersey holder to chase. Oscar Pereiro didn’t want to put his men on the front and burn them out, so the peloton let Floyd go. On the climbs, the chasing peloton did claw back some time, but Floyd’s superior descending skills pulled back that lost time. And on the final climb Floyd lost some time, allowing Pereiro to retain the jersey by a hair. Allen Lim, one of Floyd’s trainers, had posted the watts generated during the stage (watts is the amount of energy produced). And while beyond the ability of ordinary riders, not unnaturally high, and within range of an athlete with Floyd’s ability. Floyd won that stage through guts, determination and luck, not due to any doping. With Floyd winning the Tour, it was natural that he was going to be on our next cover of ROAD. Suddenly I was getting asked, “Are you still running Floyd on the cover?” My answer, ABSOLUTLY! Not for a second did we think of pulling the cover. I would also like to do something with Floyd on the following issue’s cover of ROAD for our Interbike issue, one of our biggest and important issues. That is how much I believe that Floyd is innocent. Unfortunately, Floyd and cycling will get dragged through the mud for a few weeks. I know that there will always be a group of haters that love to jump on a doping story and paint with broad strokes a dismal, dope-filled picture of cycling. If that’s what you want to do, there’s little I can say to open your mind. Scandal is all you can see. For now I ask people to look at the facts and don’t get caught up in the easy, hyped-up story of doping. Give Floyd the opportunity to defend himself. This one-of-a-kind event is fully supported on a traffic-free course in beautiful Myers Park. Challenge yourself or your team to 3 miles to 300+ miles of riding on the gentle and scenic Booty Loop while raising funds and awareness for noteworthy cancer charities! WHAT: The 5th Annual 24 Hours of Booty, made possible by The Hearst Corporation. The one and only 24-hour road cycling charity ride! This one-of-a-kind event features solo and team relay options with full support on a traffic-free course in beautiful Myers Park. Challenge yourself or your team to 24 hours of riding, whether you ride 3 miles or 300 miles, on the gentle and scenic Booty Loop while raising funds and awareness for noteworthy charities! WHEN: The event will begin at 7pm on Friday, July 28, 2006, behind Queens University of Charlotte on Wellesley Avenue. All riders will finish at 7pm Saturday. Special awards for the top 3 individual fundraisers and top team fundraisers will be presented at an awards ceremony just prior to the start of the 3rd annual Bank of America Invitational Criterium on August 5th, including a 2006 Trek Madone bicycle for the top fundraiser! Maps of the Booty Loop and driving directions are on our website (www.24HoursofBooty.com). 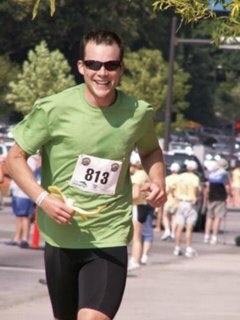 WHY: The inaugural 24 Hours of Booty was created, organized, and completed by Charlotte cyclist Spencer Lueders in November 2002 to raise money and support for the Lance Armstrong Foundation (www.laf.org). Spencer did the event solo as a "test ride" to see if it could be done, although many people came out to ride with him during the day and night. Spencer set the bar by completing 312 miles. 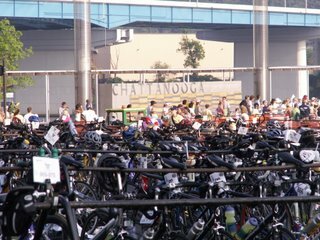 For the 2nd Annual 24 Hours of Booty in 2003, all cyclists were invited to register and participate in the event. We had a great turnout of almost 200 cyclists and raised over $33,000! The 3rd Annual 24 Hours of Booty 2004 included over 500 riders and raised over $100,000! The 4th Annual 24 Hours of Booty included over 800 riders and raised over a quarter of a million dollars! Our goal this year is to raise over $400,000, with proceeds going to the Lance Armstrong Foundation (www.laf.org) and Carolina-based cancer initiatives, such as the Brain Tumor Fund for the Carolinas (www.charlottecriterium.org/theCause.asp). HOW: Through inspiration, hope, challenge, and celebration. There are many reasons why riders participate in this event. Maybe they know someone who has battled cancer. Maybe they battled cancer themselves. Maybe they are riding in honor or in memory of a friend or loved one. Maybe they are passionate about the cancer community, survivorship, and the desire to make progress. Maybe they believe the saying “knowledge is power” begins with them. Or maybe they want to try to riding a century, but afraid to try a course that could leave them miles from home. Maybe they simply want to see how far they can ride in 24 hours. Maybe they are part of a corporate team that allows each rider to participate in whatever capacity they wish. Or maybe they want to bring the family, camp on the lawn, enjoy the atmosphere, and soak it all in. Those are just some of the reasons why people ride the 24 Hours of Booty. It is a special event, whether from a cycling perspective, or from a cancer perspective. - great fundraising award levels, including a Trek Madone bicycle for the top fundraiser! - and a fun atmosphere the whole family can enjoy! Tainted at the start, the Tour de France may have been tainted at the finish, too. 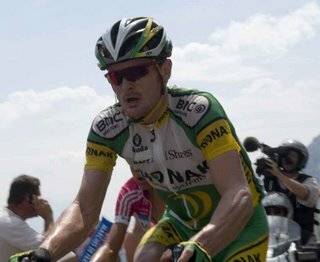 Floyd Landis' stunning Tour de France victory was thrown into question Thursday when his team said he tested positive for high testosterone levels during stage 17, when the 30-year-old American champion began his stunning comeback with a gritty charge into the Alps. The Phonak team suspended Landis, pending results of the backup "B" sample of his drug test. If Landis is found guilty of doping, he could be stripped of the Tour title, and Spain's Oscar Pereiro would become champion. My wife and I watched this tonight and both of us were inspired. I hope all of you are as well. Just to let you all know they have never finished last and have done multiple Ironmans! This is a job I definately do not want!!! DURHAM -- When Daniel Amoni moved to a new house in Carrboro, he didn't rent a moving van. After all, Amoni, a carpenter and woodworker, already had a 5-foot trailer attached to his mountain bike. So he just took off the plywood and tools that often sit there and put on bookshelves, utensils and even a bed. About 25 trips later, Amoni and his family had biked their way to a new house, a half-mile from their old home (They did use a car on rainy days). "Ever since I could ride a bike, it was always a symbol of freedom for me," Amoni said. Amoni is one of a small but hearty contingent of area residents whose bikes are their main methods of transportation. The number is growing, some bicycle advocates say, because of bike safety efforts, peer encouragement and rising gas prices. Regular unleaded gas prices were about $2.92 a gallon this week in the Triangle, according to AAA. But many avid bikers say they choose to live car-free -- or nearly car-free -- not just for financial or environmental reasons, but for fun. "I never liked driving," said Johannes Rudolph, who bikes seven miles round trip to his job at Duke University and who rarely uses a car. "Driving aggravated me." When Rudolph moved to Durham seven years ago, he chose to live in the Croasdaile neighborhood partly to have a short bike commute to work. Still, it took him awhile to feel safe riding in the city. When traffic started to scare him, he switched to a car for more than a year. But one perfect autumn morning, he woke up and "couldn't take it anymore." So he invested in bright lights and yellow clothing and saddled up again. "For me, it's how I turn on and off every day," said Rudolph, a biochemistry and chemistry professor who recently got rid of his $1,000-a-year Duke parking pass. "I need that transition period, and, in a car, I don't get it." The area is conducive to biking, Rudolph says, because it is compact. He often bikes to the grocery store or to the Carolina Theatre or the Southpoint cinemas -- but he does so on a tandem with his wife. "This way, she's never more than a foot behind me," joked Rudolph. The tandem, he added, allows one person to concentrate on signaling to traffic. Brian Highfill, a bike mechanic at The Bicycle Chain on Franklin Street in Chapel Hill, owns a pickup truck but hasn't used it in two years. He and his roommate have about 20 bikes in their Carrboro apartment. Ironically, Highfill used to be a car mechanic for NASCAR and Volvo. But he got sick of the work and "decided to veer off in the other direction." He prefers fixing bikes because they are cleaner than cars. He prefers riding bikes because he doesn't have to spend money on gas or insurance. Plus, he says, pretty much everything he needs is nearby. When he does go afar, he gets a ride with a friend. Highfill also uses his bike to deliver sandwiches for Jimmy John's on Franklin Street. About half of the restaurant's deliveries are by bike, said manager Erricca Dunn. It's especially convenient to get around UNC, where many of Jimmy John's deliveries are, on two wheels, she said. Other organizations in Chapel Hill and Carrboro also are trying to increase bicycle use. Two nonprofit groups, Students United for a Responsible Global Environment and The Recyclery, are planning to launch a bicycle rental program in September. People who pay a $10 annual membership fee would be able to borrow bikes from designated pickup points around town. "We're not trying to make money," said Dennis Markatos-Soriano, executive director of SURGE. "We're trying to increase bicycle use." Despite its appeal, riding bikes around here does have its problems. The main one, many bikers say, is car traffic. Amoni said cars have passed him when he was riding in the middle of the lane. For Scott Jewitt, Highfill's roommate, Franklin Street is a "death trap." Bikers aren't supposed to ride on the sidewalks, and cars often park on the road's shoulder. Still, Jewitt rides on the busy street each day. Rudolph takes a longer route to Duke to avoid Hillandale Road. "Hillandale is a death trap as far as I'm concerned, so I don't take Hillandale," Rudolph said. To promote bike safety, Durham officials recently wrote pamphlets on the topic for motorists and bikers and are distributing the information at libraries, universities and other locations. In August, Durham city and county officials should complete a new draft of a joint bike plan, which has goals for road improvements, bike rack additions and education measures. "There definitely are areas that are more bikeable than others," said Alison Carpenter, bike and pedestrian coordinator in Durham. Carpenter said she was confident the bike plan would make Durham more bicycle friendly. Heather Fisher, chairwoman of the Durham Bicycle and Pedestrian Advisory Commission, said community members have designated Erwin Road, N.C. 751, Main Street, Hillsborough Road, Hillandale Road, U.S. 15-501 and Morreene Road as some areas where they want to see improvements. T-Mobile Team has terminated its contract with Jan Ullrich, effective July 20, the rider announced today. The team's manager Olaf Ludwig comfirmed this to sid. Oscar Sevilla has also been sacked, as a result of his involvement in the Operacion Puerto affair. Ullrich's manager, Wolfgang Strohband, said, "The termination is groundless." If the discussions that are planned for the next week do not bring an agreement, he announced that Ullrich will be represented by Dr. Ulrich Theune, an attorney who said, "The termination will not hold up." Ullrich showed himself hurt by the process. "The termination from T-Mobile is not acceptable to me. I'm very disappointed that they didn't inform me of this decision personally, but that the T-Mobile attorneys simply sent me a fax. "They should be ashamed of themselves - after so many years of good work together and after everything I have done for the team, they just handle me like a fax number." But now, check this out from NBC News. Sports drinks might be popular, but an Indiana University researcher says that the beverage of choice for an athlete after exercise should be a tall glass of chocolate -- or any flavored -- milk. Joel Stager, who also is a swimming coach, said he tells his athletes to drink chocolate milk after practice. He said the drink helps muscles refuel and recover. "It replaces the carbs in the muscle cells," Stager said. "And the other thing it's got going for it, it has a ratio of 4-to-1 carbohydrate to protein. And when athletes are exercising, they need an increased protein intake." Stager said any flavored milk or any milkshake will do. "Milkshakes work great. (It) doesn't have to be chocolate," Stager said. Stager said athletes would do well to drink at least 12 ounces of flavored milk or milkshake after a strenuous workout. 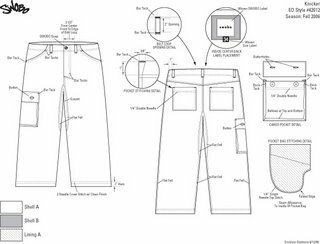 I can't afford SWOBO, but they do make a great product and they make a great argument for why regular cyclist should wear their clothes. I have a bias towards documentaries already, but this is going to be awesome and will definately be a "pre-order" from Amazon.com! I had a great ride into work this morning and me a woman named Lynn who was also biking into work. She was very nice, and bikes to work for environmental reasons (note: she had peace sign earrings). She told me for every 4 miles you drive, your car emits 8 pounds of pollutants! It doesn't take a math geek like myself to realize that the average commute in America is 16 miles (one-way; 32 round-trip). So we multiply 32/4*8 = 64 pounds of pollutants a day for the average American. Multiply this by your state (mine, Tennessee' 5.7 mm people) = Heck of a lot of nasty stuff in the air! I really do wish more people biked to work because I KNOW their lives would really be changed for the better as they would realize the REAL BENEFITS! Can I say "real" one more time? PHYSICAL EXERCISE; LESS STRESS THAN DRIVING, ENVIRONMENTAL FRIENDLY; WALLET FRIENDLY! You can tell that is at the start of the run portion. Needless to say, I wasn't smiling this much, after the run portion! My training partner's wife took this picture on Sunday. I like how Chattanooga is in the background! Thanks Katie! I forgot the best part of the triathlon - well two parts actually - my workout partner Kevin and his wife came out which was great for support and then my wife was there as well. The best part: My wife promised me some pictures for the blog but said I was going too fast on the bike to get any good ones. At first I was dissapointed and then I realized: Heck, that's a compliment! Sorry, for the delay I've been slammed at work- but it is official I have completed my first olympic distance triathlon! The swim was nice, as it was by Chattanooga's art distric and had some nice scenery with the houses. The bike was tough as we did two big bridges two times and then had some serious headwind! The run was the most dissapointing for me personally, the first half mile was straight up-hill. But now I no, what to expect for the future... I'm definately going to scale back my plans and now concentrate on getting better at the Olympic distance. I really don't think I'm going to do another sprint (with the exception of Hilton Head) due to it not really helping me accomplish my goal of an Ironman. As I told my friend Kevin, if a sprint wanted us to get better bikes, the Olympic distance will really tug at your wallet for a lighter, faster version than our current versions! I just added some great cyclist as friends so be sure to check out their sites! If anyone has any good future triathlons to do in the Southeast, let me know. Alright, the Chattanooga Triathlon is on Sunday, and I have to say that I don't really feel that well prepared given how sore I am after my measly 6 mile run into work this morning. Owell, I know I will have a lot of fun, so I'm excited. Hopefully, my wife will get some good pics for posting on the blog. I just got back from Asheville, NC and am proud to say that I had the best bike ride ever! It was pretty short - 18 miles, but it was up a mountain! I was impressed with the enormous number of cyclist in Asheville. It would definately be a great place to live. My first Olympic distance triathlon is coming up on Sunday, so I'm getting excited. I had a great swim yesterday in some very choppy water due to people skiing on the lake. Just a short bike ride today, but I plan on doing a full olymplic distance triathlon tommorow. Hope everything goes well. Just added this link to my new myspace account so it will be interesting to see how this goes. Evolution of dance This guy is my hero!